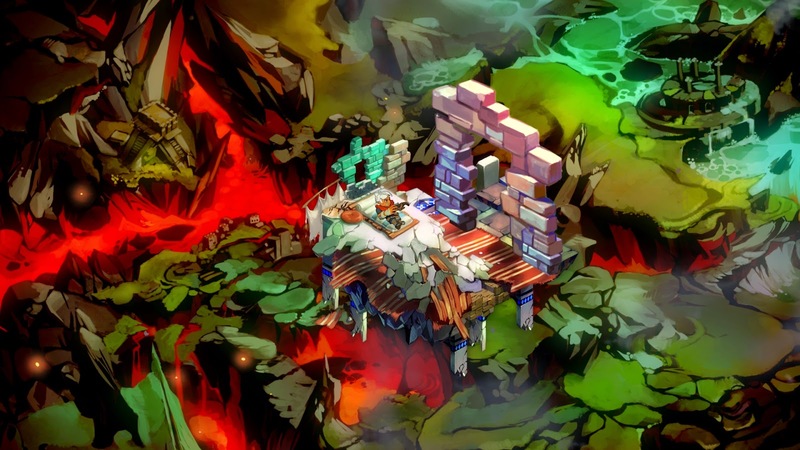 For some of you––probably gamers of the recent era––this synopsis may remind you of the 2011 Supergiant Games release, Bastion. A post-apocalyptic action-adventure game, the player controls a character simply known as “The Kid,” a youthful adventurer who lives in a world of suspended ruin, literally. Pieces of the world that used to be float in space, seemingly unconnected like leaves in a pond. What’s interesting about the game is two-fold: first, the game is narrated as you play by another character in the game. The narration is kind of dynamic, responding to how the player controls The Kid as well as revealing story. Second, but related, is that the world only exists as your character exists; where he stands is all that is real. For example, at the outset, The Kid wakes up in his bed in a room, which is just a bed on a rock with half a wall and a doorway just floating in the middle of nothingness. The player can see other floating islands in the background, all at different depths, in different sizes. The player moves the control stick which causes The Kid to get out of bed and as you guide him up and out through the door the ground literally rises up underneath his steps in disparate pieces, creating a path only as you move forward on it. It’s an unsettling feeling at first, but you quickly get used to it, especially when creepy creatures are trying to do you in. The crux of the story is that, despite the utter destruction of the world, The Kid is trying to collect fragments of the world to run a machine called The Bastion (a combination of terraformer, time machine, small town, and space ship) which––when fully powered––has the ability to undo the effects of the Calamity––the event that made the world what it is. “The Kid” wakes up amid floating ruin. 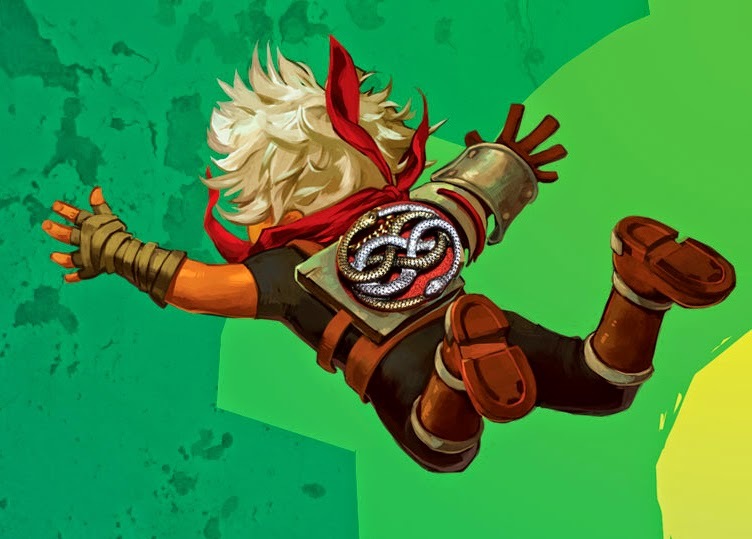 Source: Supergiant Games. For others, after listening the description at the beginning, it may remind you of the classic 1984 children’s fantasy film, The Neverending Story––the last third, specifically. The movie is based around a child in our present day finding an old book in a book store called, The Neverending Story. The viewers watch as he reads the book, which is about a hero, a warrior-boy named Atreyu, trying to save an ill princess and, at the same time, stave off the oncoming cataclysmic event called The Nothing. Not for lack of trying, Atreyu ultimately fails at the latter part of the to-do list and the fantasy world is left in literal fragments, highlighted by the image of the princess’ castle floating on a lonely bit of land in the vacuum of space, surrounded by other bits of the once beautiful world floating along side it. Even amid such destruction, the princess assures Atreyu––and the reader of the book––and the viewers of the film––that there was still hope to reverse the effects of The Nothing––in this case, it was an otherworldly entity called Bastian, which happened to be the name of the kid reading the book, a name I’m assuming it’s short for “Sebastian.” Instead of a floating city––a veritable planet all its own––the child named Bastian is imbued with the willpower to affect Fantasia, the fantasy world in the book he’s reading. What’s interesting about this is that even though, to us viewers, Bastian is as fictional as Atreyu and the princess, but he represents reality and the fact that the fictional characters of the book he’s reading can’t repair their world––and that only a person in the “real world” can––speaks to the very nature of fiction and narrative itself: the readers are as important to the creation of a story as the writer is. Fantasia becomes a world of floating ruin. While I have drawn distinct parallels between these two apocalyptic fictions––and in my research I have seen no overt mention of the movie by the game’s designers––the similarities I found most interesting weren’t the obvious ones, though they are eerie. Instead, these are fictions about fiction and use absolute destruction and vacuous absence as metaphor for a person’s engagement with fiction––how a reader or viewer actually completes the process that is “fiction.” Games, like books, when unused sit there on a shelf (or hard drive) and figuratively don’t exist when not in play simply because the whole purpose of a book or video game (or a movie, or an album, etc.) is to be consumed. Entertainment products are the closest things we have to tangible verbs in the sense that verbs only happen when they’re happening: a runner only runs when she is running, a painter only paints when he is painting. They are realities conjured by action. When looking at how this existential dilemma is brilliantly illustrated in the Toy Story movies, it’s not a far reach to think that, were things like books or video games sentient, they would be fighting night and day against this sense of non-existence––call it The Calamity, in the case of Bastion (the video game), or The Nothing, in the case of The Neverending Story. What this means for the player or reader is that consuming entertainment is not completely a passive act. The books you love don’t exist as you know them until your eyes glance over the words on the page––only then do those characters exist at all for you and they cease to be when you close the book for the night. With regard to Bastion and video games, the imagery of the ground flying up to meet your every step is a not-so-subtle metaphor for not only how games are processed internally but that polygons are only really processed at all once the player engages the controller––the real world’s umbilical connection to the virtual world. The point is that these fantastic worlds don’t just exist because someone wrote them––Emily Dickinson wouldn’t be important at all had her poems not been found locked away in a chest; they would be nothing in the cultural and historical schema otherwise because they weren’t being read––fiction exists in individual bursts of imaginative light, a reaction that occurs when a fiction finds its audience, one by one, keeping it alive like the beat of a heart.